FILE - Turkish-Iranian businessman Reza Zarrab, who is charged in the U.S. for evading sanctions on Iran, watches a concert in Istanbul, Sept. 8, 2013. Turkish prosecutors on Nov. 18, 2017, launched an investigation into two U.S. prosecutors involved in trying Zarrab, according to the country's official news agency. The politically fraught trial of a Turkish-Iranian businessman accused of running a multibillion-dollar scheme to evade U.S. sanctions on Iran gets underway next week but is widely expected to start without the main suspect: Reza Zarrab. Zarrab is a 33-year-old multimillionaire of dual Iranian-Turkish citizenship with business interests in Turkey and the United Arab Emirates, and ties to the governments of Turkey and Iran. He was arrested in Florida in March 2016 while on a family trip to Disney World and later moved to New York to face criminal charges of helping Iran evade U.S. sanctions between 2010 and 2015 by laundering money through the U.S. financial system and bribing Turkish officials. U.S. President Donald Trump shakes hands with Turkish President Recep Tayyip Erdogan during a meeting at the Palace Hotel during the United Nations General Assembly in New York, Sept. 21, 2017. The impending trial has become a flashpoint in deteriorating U.S.-Turkish relations. Turkish President Recept Tayyip Erdogan has personally lobbied the U.S. to release Zarrab, raising questions that Erdogan and other Turkish official are worried Zarrab could implicate them with bribery and corruption. Meanwhile, the recent transfer of Zarrab from a federal detention center in New York to an undisclosed location has prompted speculation that he is cooperating with U.S. prosecutors, possibly on unrelated matters of interest to Turkey. FILE - Turkish-Iranian businessman Reza Zarrab, charged in the U.S. with allegedly evading sanctions on Iran, is surrounded by reporters as he arrives at a courthouse in Istanbul, in a separate case against him, Dec. 17, 2013. Zarrab is accused of using a network of front companies in Turkey and the UAE to disguise hundreds of millions of dollars of business transactions on behalf of the Iranian government and other Iranian entities. To facilitate his scheme, Zarrab allegedly paid tens of millions of dollars to Turkish government officials and bank executives. The sanctions, aimed at Iran’s access to U.S. financial institutions, were lifted after Iran struck a deal with the U.S. and other major world powers in 2015 to keep a peaceful nuclear program. Eight other people, including Zarrab’s 39-year-old brother, Mohammad Zarrab, and a former minister of economy, Mehmet Zafer Caglayan, have been indicted on charges related to the scheme. But only one other, Mehmet Atilla, a former deputy general manager of Halkbank, one of Turkey’s largest banks, has been arrested. Their trial has been repeatedly postponed and is now scheduled to start Monday in New York with jury selection. In court filings, prosecutors have alleged that Zarrab has had a personal relationship with Erdogan and that Erdogan may have known of of Zarrab’s sanctions-busting scheme. Erdogan is not accused of any wrongdoing, but he and other Turkish officials have slammed the case as a conspiracy against Turkey. Yet as Zarrab’s trial draws near, there are indications that Zarrab may be negotiating a deal with U.S. prosecutors. For starters, his whereabouts remains a mystery. According to the U.S. Bureau of Prisons website, Zarrab was “released” from the Metropolitan Correction Center, a federal detention center in New York, Nov. 8. Nick Biase, a spokesman for the U.S. attorney for the Southern District of New York, confirmed Zarrab’s detention to VOA but declined to elaborate. Legal experts say Zarrab’s release from federal detention is an indication that he’s talking to prosecutors as part of a guilty plea deal. Benjamin Brafman, Zarrab’s lead attorney, did not respond to a request for comment. In recent weeks, Brafman and Zarrab’s other lawyers have not participated in key pretrial proceedings, such as providing questions for prospective jurors. That has fueled speculation that Zarrab may skip his own trial. Eric Jaso, a former federal prosecutor now a partner at the Spiro Harrison law firm in Short Hills, New Jersey, said the absence of Zarrab’s lawyers from court proceedings could mean Zarrab is cooperating with the government. Adding to the mystery, the federal judge overseeing the case dropped Zarrab’s name from the title of the case in an order issued Monday and replaced it with Atilla’s name. The title change suggests Atilla will be the only defendant on trial Monday, Richman said. “It is also consistent with Zarrab’s having already entered a guilty plea, although that is not necessarily the case,” Richman said. 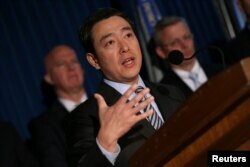 FILE - Joon H. Kim, the acting United States attorney for the Southern District of New York, speaks at a news conference in New York, April 25, 2017. Acting U.S. Attorney Joon Kim, whose office is prosecuting the case, gave no indication last week that his office has dropped the case against Zarrab. “This case, our case, the prosecution that’s going on and we’ll start next week in the courthouse, was brought and will continue to be brought by career prosecutors, by career FBI agents and investigators,” Kim said at a press conference.